The fat is in the fire now! People are seeing that downsizing from 23 to 16 councillors will really redefine the representative districts boundaries. People can see what they will gain, and what they will lose. Staff quietly put the proposed boundaries for the smaller 16 representative council online late Friday, at quitting time or there abouts. This meant that alert internet nerds (like me) were able to break this story and have a field day dissecting the two proposals before the media got a hold of it. There will be minimal public consultation, and only after the two proposals have been generated. It seems to me a public dialog about principles of districting should come before the models were generated. There will be no tying the re-districting to other issues of governance, as the ad-hoc group that I am a part of requested two weeks ago in an open letter. This means, for example, the idea of sensible community Council boundaries informing the district boundaries has not been examined. The spread in population is in some cases enormous. 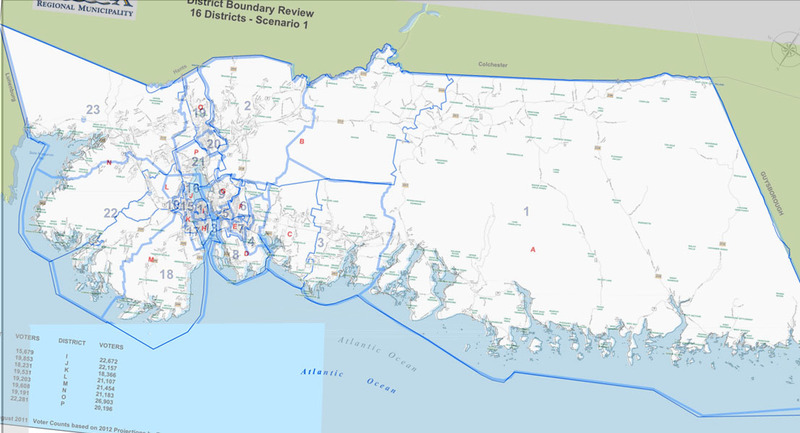 I am not sure people in HRM will accept one scenario having a population difference of 11,000 between districts, the smallest being 15,000, largest around 26,000. 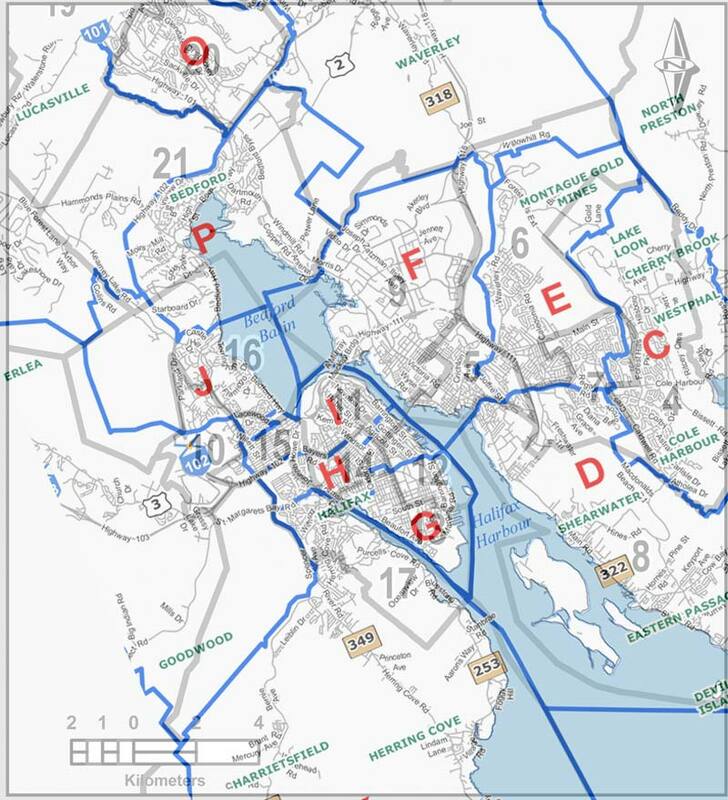 According to staff, scenario one follows the general outline of current district boundaries while expanding the size and voters in each district, and scenario 2 builds district boundaries out from Halifax Harbour moving out in an easterly and westerly pattern taking into account the required number of voters per district and community patterns. Both scenarios are trying to stay inside a size range that is plus or minus ten percent of the average, of 22,524 voters in 16 districts. I have made maps that overlay the old districts on the new, I hope they help, rather than confuse. Click on it for a bigger map. Original maps and other info here. As I’ve said before, building a map based on the old districts effectively means one in every three districts gets split between two adjacent districts. This proposal sees whole districts split, for example District 22 – Timberlea – Prospect disappears into expanded St Margaret’s Bay and Herring Cove districts, with a but toward the centre being attached to Rockingham/Wentwort. Over on the east side of the Harbour District 3, Preston – Lawrencetown – Chezzetcook is devided between old district 1, Eastern Shore, and the new district containing Lake Loon, Cherry Brook and Westphal/Forst Hills. Lower, Middle and Upper Sackville are amalgamated into one huge district, 26,000 voters, while enlarged as it is, the new Eastern Shore district still only has the population of 15,679, creating great issues in terms of balance and fairness in the district sizes. It gets even more interesting in the core of both Dartmouth and Halifax, where both former cities lose their downtown districts. Downtown Dartmouth to Burnside forms one, Hawthorne to Penhorn, Waverly Road and Caledonia form another, Mainstreet to Portland Estates and down to the boarder of Shearwater form a third, and A kind of Sullivans Pond to Woodside area is created for the rest. Halifax would see a district from Point Pleasant park to Cornwallis and Allan Streets, then a far north end district that includes Fairview, and then a West End District that jumps the rotary and includes Springvale, Armdale and Cowie Hill. This proposal is built on a new model, from the inside, or core, out. The south end would stop at Cogswell/Quinpool and Allan, and then two strips from the Springvale onto the peninsula to the Harbour in the centre, and from Fairview through Kempt Road to the Harbour in the north start the process. From there, a lot of it flows logically, though Eastern Passage extending all the way to Portland Street and Portland Estates will raise eyebrows, as will the south shore/Tantallon district with only 14,809 voters. That said, the biggest district in this model is only 22,726 so it seems a fairer distribution over all. 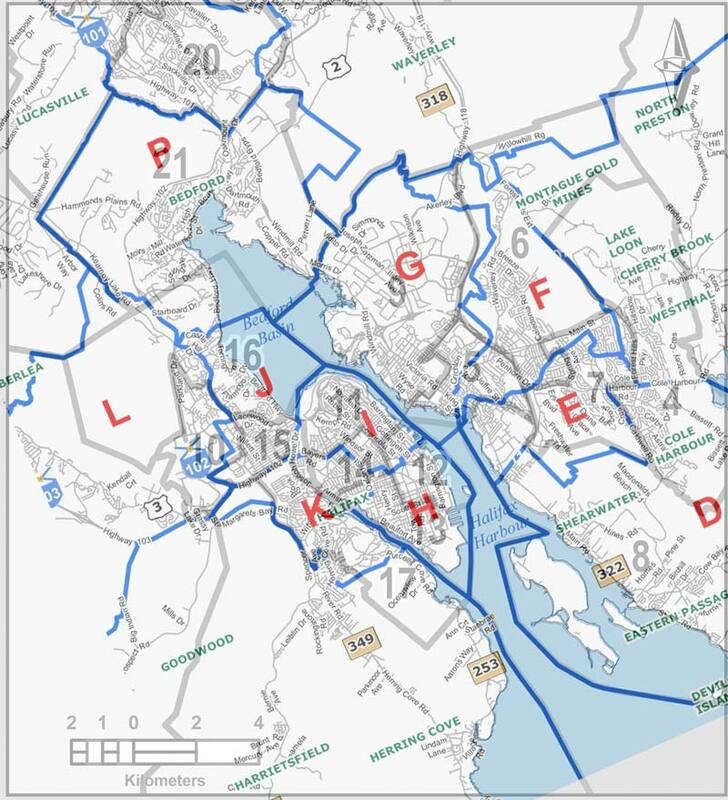 I suspect the biggest opponents of this plan will be the eastern shore, where two districts are created, one on the shore, one inland, not unlike the way the federal ridings are laid down in that part of Halifax. This will break up the Musquodoboit valley between two districts, throwing a dividing line down the middle of that community. Also upset will be Upper and Middle Sackville, who find themselves attached to Lucasville, Glen Arbour and Kings Wood, rather than cozied up to Lower Sackville. If I had to pick a scenario I’d go with option two. By abandoning the past and going at re-districting more scientifically, it resulted in a better distribution of population and better more representative districts, for the most part. That is the key… for the most part. No re-districting is going to make everyone happy. On the whole, it is a better plan. That said, I think that work can be done to make the proposed Tantallon area district a bit bigger in population and size, and to re-look at the division of the eastern shore. It would not be hard to imagine a district roughly the size of the current district one, with it’s western boarder pushed towards the city, around Conrod Settlement, and then another district wrapping around the eastern end of the city, from Beaverbank to Three Fathom Harbour. Still some geographic discontinuity, but it allows for the eastern shore to continue as an inarguably fully rural district, outside of the commuter area of the core and Burnside. People need to get involved. Go fill in the survey, but more importantly, email the staff and tell them what you really think! Only though public input can we ensure we get the best possible results.